When Should Dor Yesharim Be Tested? Below I will post purpose and reasons for DY testing as provided by the Chicago Center for Jewish Genetic Disorders and Children's Memorial Hospital. Recently the question has been posed, when should one check for DY compatibility - before considering any suggestions or only after both sides have done their due diligence and are ready to proceed to date? In my opinion, DY checking should only be done once all due diligence has finished and both families are ready to proceed. The exception would only be in the circumstance where both sides are aware that a specific genetic problem may be present. Otherwise, protocol is not to check DY every time a suggestion is made. When DY numbers have been exchanged, both sides have committed to start the process to date each other and should not entertain other suggestions until after dating. A gene is made of DNA, the basic genetic material. It carries the chemical instructions to make all the proteins in the body has the instruction or “code” for one particular protein. We have two copies of most genes. 4. What is a genetic mutation and how does it lead to disease? A change in the DNA of a particular gene can result in an alteration of the genetic instructions. Some genetic alterations are not harmful but are part of our genetic differences (for example, hair color and eye color). An alteration in a gene can lead to disease by affecting the function of that gene. 5. Many of the Ashkenazi Jewish genetic disorders are inherited in a recessive fashion When both parents are carriers for the same disorder, they have a 25% chance in each pregnancy of having an affected child. Every individual is estimated to be a carrier of 6-8 genes which can produce disease. Carriers are generally not affected because they have a fully functioning copy of the disease gene. Only when both copies of the gene are not functioning will an individual be affected with the disease. Most carriers will have no family history of that genetic disorder. Certain ethnic groups have a higher risk for certain genetic conditions than the general population? & Disease – Judaism is not only a religion and culture, but also a distinct ethnicity. A few individuals migrated and founded a new, isolated population. Within this group there was a founder who carried a genetic mutation. The group was then, by chance, different from the population that the settlers came from. 9. For what diseases are Sephardic Jews at increased risk? 10. What disorders are Ashkenazi Jews at increased risk for? There is no set panel of Ashkenazi Jewish genetic disorders. Different labs screen for different panels of these disorders. Diseases listed in italics are explicitly recommended by American College of Medical Genetics (ACMG). The others on the right fit ACMG criteria except the last four. Please see the Chicago Center website, www.jewishgenetics.org, for more detailed information about the disorders. 12. To whom should screening be offered? Carrier screening is available for disorders more common in the Ashkenazi Jewish population by looking for specific mutations that are most common in this group. Individuals with at least one Ashkenazi Jewish grandparent, or suspected Ashkenazi ancestry, should be offered screening. Screening should still be offered to a Jewish individual even if his/her partner is not biologically Jewish, as none of these disorders are exclusive to the Jewish population. 13. What options are available to couples found to be at risk? 14. How successful is carrier screening? 16. A decrease in the number of affected individuals DOES NOT mean a decrease in carrier frequency. 17. Why would someone choose not to be screened? Parents were screened for Tay-Sachs— but we now screen for many more disorders. Marrying someone who is not Jewish— but testing is still recommended for the Jewish partner. Cost—Many insurance plans do not cover carrier testing. Participants do not receive their results, only their genetic compatibility with a potential marital partner. 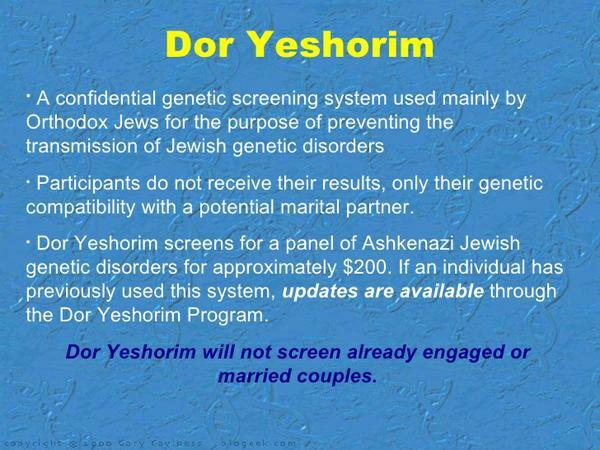 Dor Yeshorim screens for a panel of Ashkenazi Jewish genetic disorders for approximately $200. If an individual has previously used this system, updates are available through the Dor Yeshorim Program. Dor Yeshorim will not screen already engaged or married couples. 19. For more information about carrier screening or to find a local genetic counselor, please visit www.jewishgenetics.org The Center is a cooperative effort of Jewish United Fund/Jewish Federation of Metropolitan Chicago and Children’s Memorial Hospital and is funded in part by the Michael Reese Health Trust.